Veteran options trader Dan Passarelli explains a new methodology for option trading and valuation. 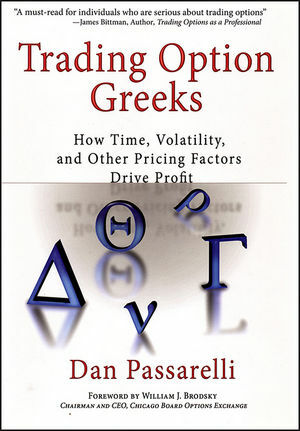 With an introduction to option basics as well as chapters on all types of spreads, put-call parity and synthetic options, trading volatility and studying volatility charts, and advanced option trading, Trading Option Greeks holds pertinent new information on how more accurate pricing can drive profit. Most options traders focus on strategies such as covered calls, vertical spreads, butterflies and condors, and so on. But traders often don't know how to use the "greeks"—the five factors that influence an option's price—to trade more effectively. Using the greeks can lead to more accurate pricing information that will alert an option trader to mispriced derivatives that can be exploited for profit. In straightforward language and making use of charts and examples, Passarelli explains how to use the greeks to be a better options trader. Dan Passarelli began his career as a floor trader at the Chicago Board Options Exchange (CBOE), trading equity options and later agricultural options and futures on the floor of the Chicago Board of Trade (CBOT). He currently provides options education to retail and institutional traders at a premier brokerage firm. Passarelli was an instructor at the Options Institute, which is the educational arm of the CBOE. He also worked with the Options Industry Council (OIC), educating retail traders via podcasts, webcasts, live seminars, and has written numerous published articles. Part I The Basics of Option Greeks. 4 Option-Specific Risk and Opportunity. 5 An Introduction to Volatility-Selling Strategies. 6 Put-Call Parity and Synthetics. 8 Dividends and Option Pricing. 10 Wing Spreads: Condors and Butterflies. 11 Calendar and Diagonal Spreads. 12 Delta-Neutral Trading: Trading Implied Volatility. 13 Delta-Neutral Trading: Trading Realized Volatility. Part IV Advanced Option Trading. 17 The Trader’s Thought Process.